Angela Davis Speaking at Vassar on Wednesday, Sept. 16 – Read all about it! As many of you have heard, Angela Davis will be speaking at Vassar on September 16th to commemorate the 40th Anniversary of the Women’s Studies Program at the college. We here in the library are looking forward to Davis’ return to Vassar, and are taking this opportunity to read about her life and her work. Looking at the library’s resources on Angela Davis is an excellent example of the broad range of books, primary sources, films and journal articles that you can find here. 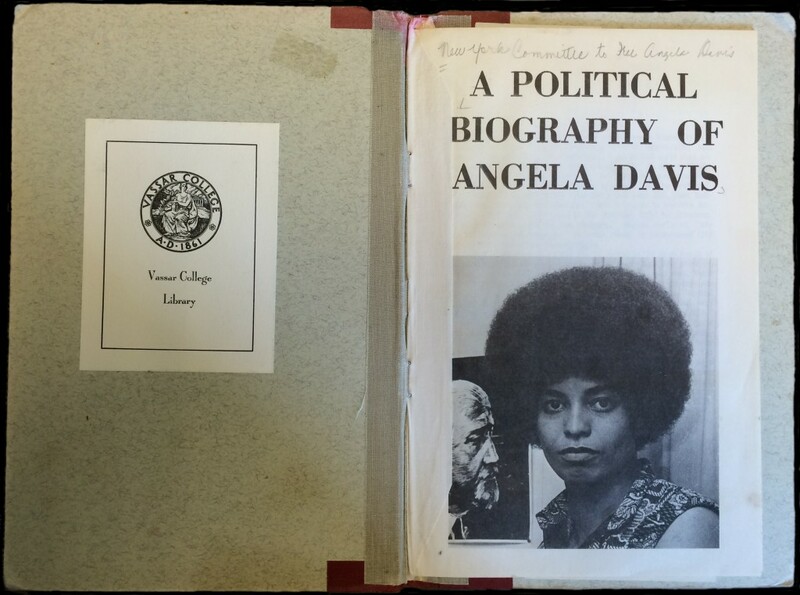 On the shelves in the Main Library, you’ll find “A Political Biography of Angela Davis,” a pamphlet that was published by the New York Committee to Free Angela Davis in January, 1971, as Davis was awaiting trial. If you’d like to dig deeper into the primary sources available about Davis’ trial, you’ll find a selection of documents related to the campaign to free Angela Davis in the database, “Women and Social Movements in the United States, 1600-2000.” You can read Davis’ early work, such as her essay, “Reflections on the Black Woman’s Role in the Community of Slaves,” originally published in the journal, The Black Scholar in 1971, or the autobiography she published in 1975 (in print or online). Or you could read a collection of her more recent speeches and essays, The Meaning of Freedom (excerpted here) or a collection of interviews with Davis, Abolition Democracy: Beyond Empire, Prisons and Torture, published in 2005. You could also learn more about Angela Davis’ background by reading her contribution to the book, Falling in Love with Wisdom: American Philosophers Talk About their Calling or by reading about the formative years she spent in France, recounted in Dreaming in French: The Paris Years of Jacqueline Bouvier Kennedy, Susan Sontag and Angela Davis by Alice Kaplan. Perhaps you’d like to watch a documentary film or two? 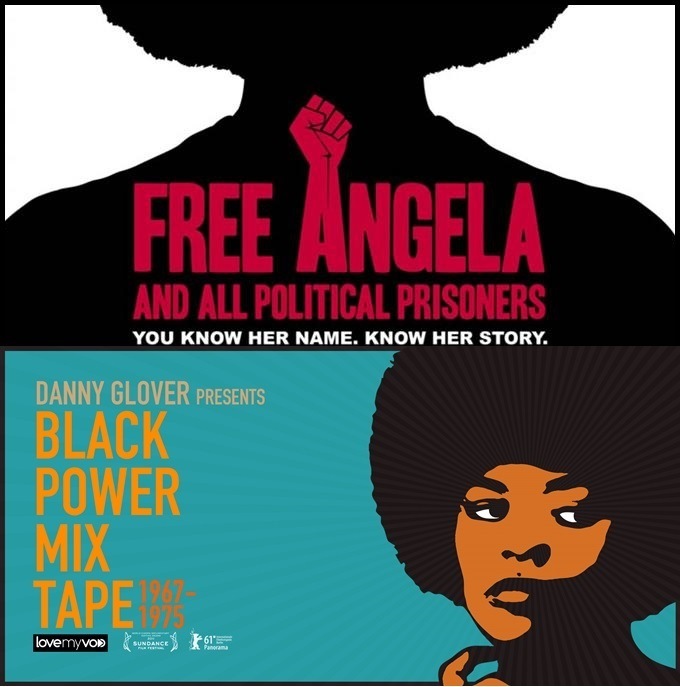 Invite some friends to watch Free Angela and All Political Prisoners (2013) or Black Power Mixtape (2011). However you prepare, we hope to see you at the Chapel on Wednesday, September 16th at 5:30. This entry was posted in collection highlights, events and exhibitions by grlieb. Bookmark the permalink. Angela’s last visit was inspirational and informative and I hope to be there Wednesday.